A paddle holster is a popular type of outside the waistband (or OWB) holster. A paddle holster utilizes a rigid “paddle-shaped” flat or contoured broad clip to secure the holster to the user’s belt or inside the pants waistline. Do yourself a favor though, and wear a gun belt. The paddle holster is a popular way to concealed carry because it is convenient. The paddle is easily clipped anywhere on the user’s waistband that he or she finds most comfortable. Once place, it will sit there safe and secure, especially with today’s paddle designs. To remove the holster, simply pull it out, safely store it, and go on about your business. Paddle holsters are relatively easy to conceal provided you are properly dressed for concealed carry. Loose fitting shirts, coats and jackets can ensure more effective concealment while carrying with a paddle holster. Some find they are more comfortable while seated. 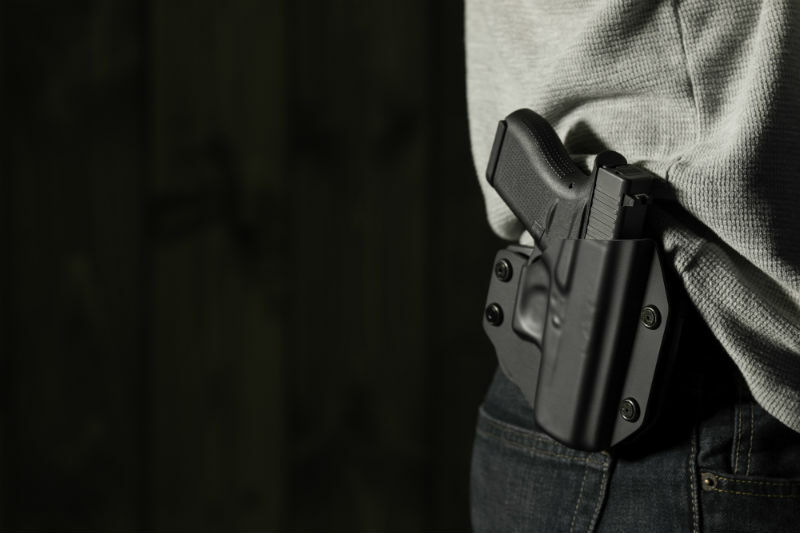 Since you can adjust where the holster is placed on your waistline, you won’t have to worry about the firearm digging into your leg the way belt loop holsters can. Paddle holsters do have some disadvantages for concealed carry purposes. First, paddle holsters stick out further from your body than belt slide holsters do, thereby making it easier for them to print. If you’re not wearing the proper clothing to ensure concealment, the whole world’s going to know you’re armed. Second is the security factor. Paddle holsters rely on friction to stay securely fastened to your waist. Your holster should be firmly clipped in place allowing for no wiggle room. 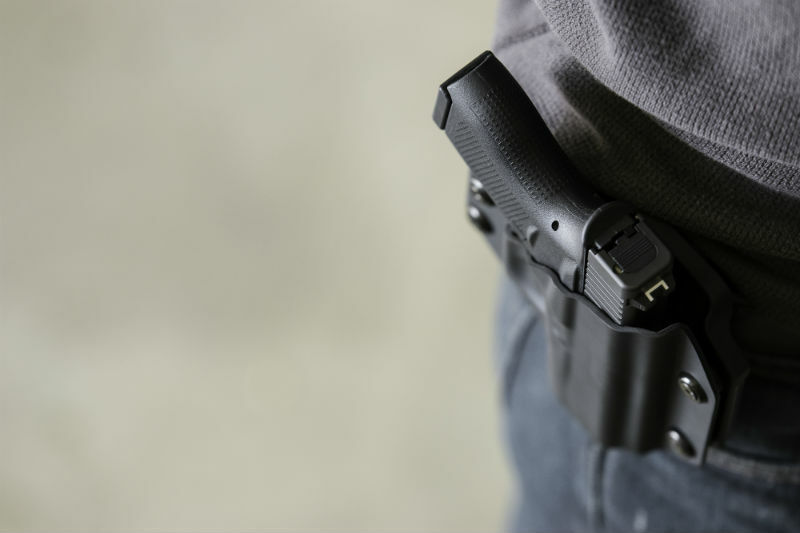 In addition, your holster should have a good retention system that holds your firearm securely inside the holster until YOU are ready to remove it. The last thing you want is to have your gun separated from you when you are running, horseback riding, or engaged in a physical altercation where someone could try to “grab” your weapon. Any holster must have adequate retention, and the need for paddle holster retention is no exception. Paddle holsters rely on the same retention devices as other holsters – passive and/or active retention. Passive retention systems rely on friction to secure your gun inside the holster. 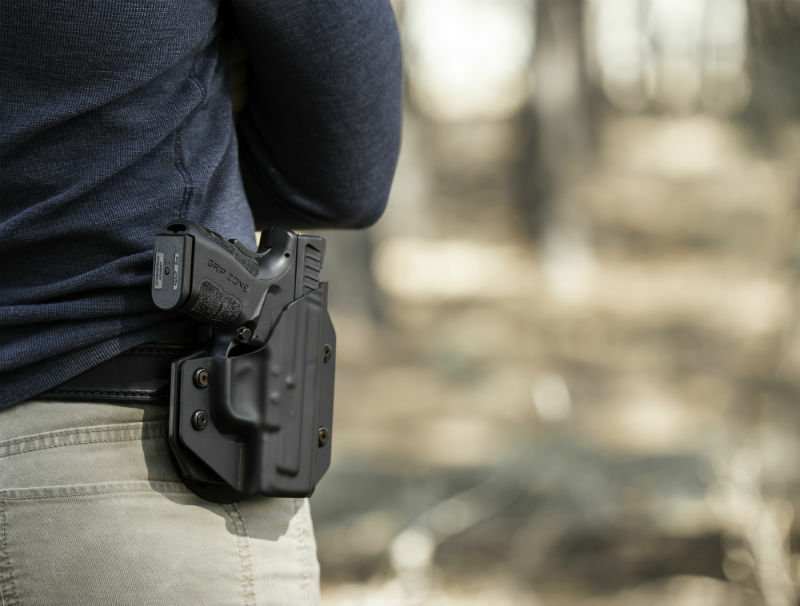 Active retention systems employ a mechanical process, such as a retaining strap or hood that covers the hammer to secure your firearm inside the holster. This retaining strap or “thumb break”, as it is sometimes called, is kept in place by a metal snap, and is disengaged by pushing the thumb upward against it. Some paddle holsters have a trigger guard or button that secure the weapon until the user squeezes or presses down on it for release either by the thumb or forefinger depending on the holster model. Leather paddle holsters will fit very tightly at first, but will need to “break in” for the best fit. Some leather holsters feature a retention screw to tighten the fit. Some leather holsters, especially those of higher quality, will be tailored for your actual gun. Some will not be, however; if that’s the case, a model with a thumb break may be a wise investment. Plastic holsters, especially those molded specifically for your firearm, will fit very securely. Many will have adjustable retention as well, though many do not. You will have to decide for yourself whether adjustable retention is an attribute that you’re looking for. Some paddle holster models have a passive and an active retention system that are referred to as “Level 2” retention holsters. 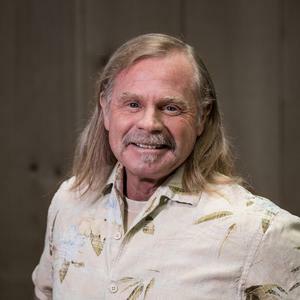 However, there is some debate whether active retention systems are truly necessary for concealed carry purposes unless you are doing some activity like jogging, dancing, skydiving… you get the idea. There are so many paddle holster companies in the market to choose from today. Each company has a slew of different models, made from different materials, that come with different features. Deciding which paddle holster will best suit your needs doesn’t have to be so complicated. I recommend that you take a close look at the Alien Gear Cloak Mod Paddle Holster. This holster comes with an adjustable retention shell, is adjustable for tilt angle, and has a spring steel core, along with a bunch of other great features. 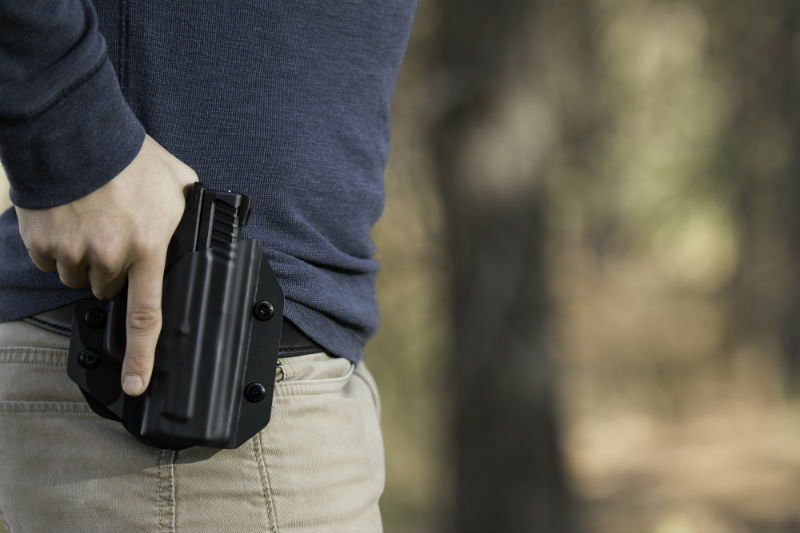 Worn properly, paddle holsters are very effective for concealed carry.